The mission of the Advocacy Committee is to create and maintain relationships with local, state, and national officials so that we may have opportunities to advocate for and lend support to breast cancer relevant bills and public policies. We work with the local, state, and national elected officials to help them understand that breast cancer is a major health issue in this country affecting millions of women and families. We attend the National Breast Cancer Coalition‘s Advocacy Training Conferences each year in an effort to provide our own community with as many trained advocates as our funds will allow. We participate in medical and scientific conferences each year to strengthen our position in the scientific community. We work with the National Breast Cancer Coalition by contacting our members of Congress regarding legislation on quality and availability of care, healthcare reform, and research funding. We work with citizen and environmental agencies and organizations, such as NYPIRG, BCERF, the Just Green Partnership and RAMP, to increase awareness about environmental hazards related to breast cancer and other public health risks. Learn more about our Committee’s Local and National efforts. August 7, 2019 4:30pm – 6:00pm. Come to meet our local legislators, hear about the services we now provide, and have an opportunity to discuss how we can work together toward our mission of eradicating breast cancer. 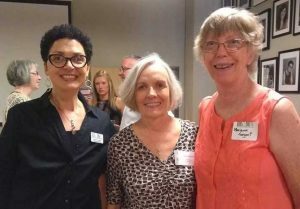 Learn more about the Terri Schmitt Legislative Reception here. Click here to learn about best practices for pink ribbon promotions.